People can be silly sometimes. And when they drink too much they can be even sillier. I often review news sites for story ideas both for this blog and my political satire blog Slings and Arrows. When I really get desperate for something to write about, I take a peak at the "Odd News" websites. They're usually good for a laugh - kinda like a print version of America's Funniest Videos. You know what I mean. Whenever I watch that show I marvel at how stupid people can be. Not only that but they record their half-brained efforts and send them in to share their stupidity with millions upon millions of television viewers around the world. They should re-name that show "America's Got Stupid People" or "So You Think You Can Jump Off A Roof Onto a Trampoline and Dunk a Basketball". Too bad "Biggest Loser" is already taken. Where was I? Oh, yeah, people can be even stupider when they drink. Take for example, Oleksandr Nayda of Monroe, New York. On a recent Saturday morning he found a stray Rottweiler and drove to the police station to inquire where the animal shelter might be. Police smelled alcohol on the good samaritan - at 10 o'clock in the morning - and jailed him on $1,000 bail. Next time, if your drunk and driving, it might be cheaper to just run over that puppy. Or how about the guy in Iowa City, Iowa who was arrested after striking a street sign with his car. 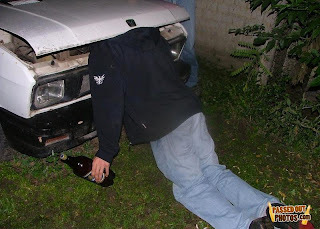 He ditched his car, because he'd been drinking and took off. Police later caught up with the man who wasn't wearing a stitch of clothing. Witnesses were able to identify the man because they'd earlier seen a naked man drive away from a convenience store. There's a lesson here. If you're going to drink and drive wear clothes. It'll be harder for witnesses to identify you. Then there's this gem from New Port Richey, Florida. A man called 911 with an emergency. When police arrived at the man's home they found him to be "very intoxicated". What was their first clue? Well it seems the reason he called 911 was because his mother took his beer and he wanted to have her arrested. That sounds like an emergency alright. Charles Dennison told police he'd keep calling 911 until she was charged. Turns out he was charged...with making false 911 calls and put behind bars...no, no not those bars - jail cell bars! Lesson? 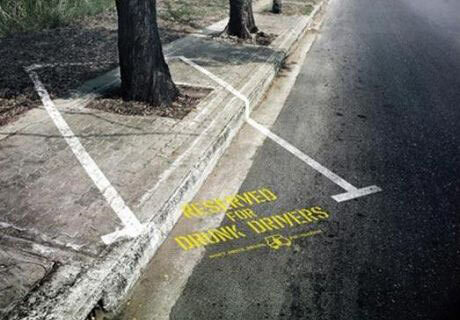 If you drive don't drink. And if you drink don't drive to the police station or call 911. Sheesh. Once or twice okay, but upwards of thirty times a night? I found this Speed Stick schtick to be annoying and an insult to my intelligence. Kind of makes me wonder what the boys at the ad agency, who dreamed this up, were drinking. I always admire the inventive ways men come up with getting bashed between the legs on AFHV. I laugh every time (though, when I think about it, it might be nervous, thank-God-it-wasn't-me laughter). Cdn Blend: Yep, that's the kinda thing I'm talking about. An eeek for that commercial. I'd like to add another annoying antiperspirant commercial. AXE. The guy lifts his arms and waterfalls spray out. You rooting for Boston or LA? Quirks: Yeah that armpit waterfall ad is another one on my list. I'm going for the Celtics, so last night was a good one! I really like those "odds and ends" sites too. I used to really enjoy seeing unusual pictures, but hell now everything is so easy to photoshop it's getting to where a guy can't even believe his own eyes. That is a seriously stupid commercial! Don: Oh I believe that stuff. And who wouldn't believe some guy with yellow birds flapping in his armpits?! MamaZen: Oh, good. It's not just me. Imagine watching it all evening long! Yeah, that armpit commercial made the rounds of the Stanley Cup broadcast last night. Personally, I've never seen canaries thrashing around some guy's underarms but if it's on TV, it must be true. Or, the idea for that commercial was the result of a 3 martini lunch. RA: Wha? For me? Thanks. I think. I'll be over to check it out. Kelly: I think your second thought hit the nail on the head. Now if we could just hit those birds in that guy's armpits. AFHV just got too stoopid after awhile, and those people weren't drunk (well, as far as I could tell). I'm surprised that the SPCA wasn't all over the butts of those producers of that commercial. Like, really, they could have used bananas or somthing. And I used to love yellow canaries. Thanks commercial people, you've ruined something else. And yeah, drunks are hilarious. 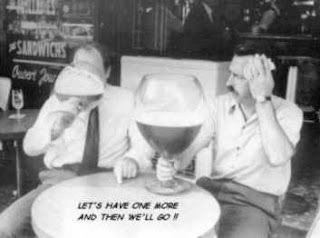 00dozo: Yeah, the sun's over the yardarm and it's time for a drink! Cheers.